Letter carriers should be afraid. Very afraid. 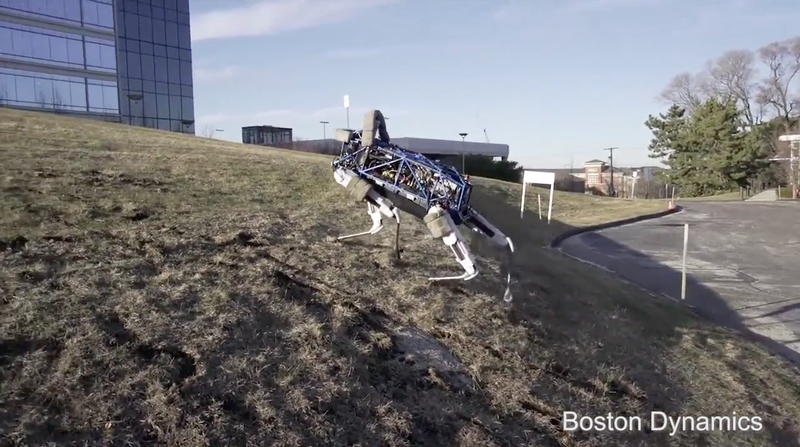 Meet Spot, a 160-pound, four-legged, dog-like robot developed by Google-owned defense contractor Boston Dynamics. In the not-so-distant future, high-tech hounds like Spot will bury bones, all right—the bones of all humankind! Kidding, of course. Boston Dynamics manufactures cutting-edge canines large and small, and I'm sure they'll make the world a better place. Or something. Their bark is probable worse than their byte. At the very least, these power-driven pups will be best friends for the automatons like Baxter that will inherit the Earth. Feline fanatics, meanwhile, can check out the same company's Cheetah bot, which runs 28.3 miles purr hour.